How is blogging goes on Blogger? You may come up with post ideas everyday and you wanna share them with your blog readers. I know, you enjoy blogging. But as you write a new post, an older post will get hidden from your homepage. Your homepage get the attention of visitors. Especially, new visitors. Hence if you can deliver more content on your blog's homepage, you can maximize exposure for multiple posts too. Do you? You go write a post, format and publish. After publishing, your full post will appear on the homepage of your blog. Do you have such a blog where it show off full posts on homepage? It doesn't matter, if you are not publishing posts frequently, such as if you are a person who post weekly, monthly or so. So your posts remain certain amount of time on homepage and it will get more exposure as it remains more time on homepage. Remember, all your readers are not online always and busy with their own works. So they may visit your blog weekly or so. Yeah, I know what you thinking. If you post daily or frequently, they will miss out your posts too. Also as you show full posts on homepage and more posts on it to grab more exposure, it will get heavy and lengthy than any other page. So readers will find it bulky and it will take more time to load your homepage. Even regular visitors will find it disturbing as it takes more time to load. As an alternative you can decrease number of posts shown on your homepage. But as the number of posts shown on homepage get decreased, the exposure for posts would be decrease too. So if you post frequently, you have to balance it all. You have to think about showing more posts on homepage while not affecting on page load time of your homepage or giving impression that your blog is bulky for visitors land on your blog. As a solution for this, Blogger offers Jump Break option to use when you writing posts in Post Editor. You may have never heard of it or use it before but it's not a new feature. Blogger jump break will help you to show snippet or summary (first few words or paragraphs) of your post on the homepage and readers needs to click jump break link to view your full post if they interested in. 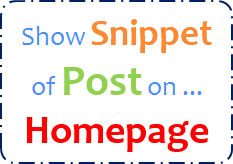 It will save more space on your homepage and help you to show off more posts without affecting the page loading. Does it affect on user experience? No, it doesn't. What if people need to wait for long time to render your homepage? Yeah, that's what affect on user experience. They will leave your blog even before they read the title. So if you post frequently or wanna deliver more for your new visitors, using jump breaks would be really helpful and your homepage won't looks bulky anymore. 3. Either click New post button to add content to your new post or jump to Posts tab and click Edit link by hovering on your existing post. 4. Now place the cursor where you wanna add jump break. 5. Click on Jump Break tool on the toolbar at Post Editor. 6. Now a horizontal line will add to the place you have positioned your cursor before. It represents where your jump break added in. 7. Preview your post and confirm your post formation is not affected by jump break. Note: You won't see jump break in preview mode as it shows preview of your full post page. 8. Now publish, update or save your post. * Would you like to personalize the read more link on the homepage? Read How to Align Jump Break to Right in Blogger and Turn Jump Break into an Image in Blogger. This is interesting Mayura, will it work on both the new formats (Dynamic views) and old? I have some blogs on each and wonder if it would work for both. Thanks for sharing again! Owh... That's a good question :) Unfortunately, yet it doesn't work with Dynamic Views dear. So if you have a blog with Dynamic Views, you have to ignore this one. However blog with Dynamic Views are more faster too. But yet affects on performance if you publish lengthy posts in "Classic" view. I hope Blogger will work on it. Thanks Mayura. I'll have to check it out with my nature one. You're welcome dear :) Absolutely, if you post frequently on that one or have lengthy posts which keeps your readers waiting until loading all content, you should think about using jump breaks. Woopies :) Thanks Brenda. Yeah, WordPress does it better creating snippets of post automatically, but it depends on number of characters. But I've seen some Blogger templates made that way too. They show off snippet of post on homepage without jump breaks. You may Google it ;) I ll let you know if I can find too. You're welcome dear :) Glad to hear it was easy to follow and could make use of. This helped me so much! I never knew what that was for! Awesomeness! Awesome! :) You're very welcome and hope you will have fun using jump breaks dear. Thank You very much you saved the day ! You're welcome mate ;) Glad you could use a help and started using jump breaks now. Wow this is super kool! Coolie, indeed! ;) You're welcome, Kaarunya and have fun with jump breaks dear.